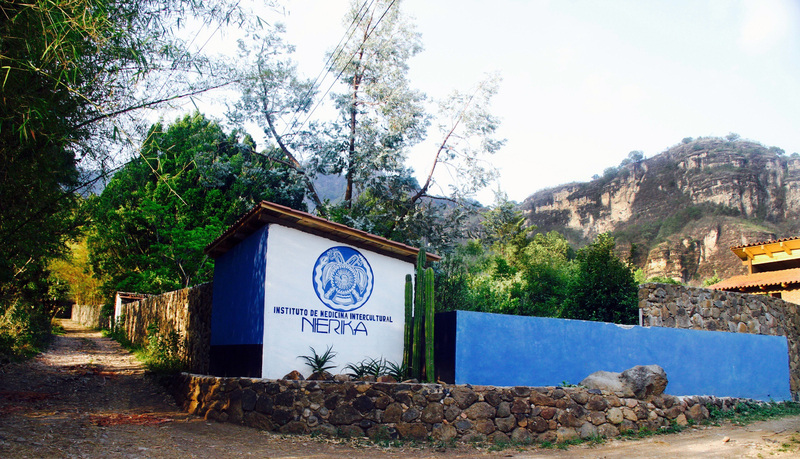 Nierika is situated in a very special location, close to historical towns and sacred sites, where people from all parts of Mexico come to make religious pilgrimage. Even before the Spanish conquest, Chalma, Xochicalco and Malinalco used to be considered sacred by the prehispanic cultures, such as the Aztects & Toltecs. Ancient myths and archetypes live on in nearby historic world-heritage sites, temples and spiritual pilgrimage routes. In the times of Aztecs and Toltecs, Chalma used to be the sacred site of Ozteotl, god of the caves, which was considered one of the aspects of Tezcatlipoca, one of the most important deites in the Aztec mythology. Tezcatlipoca, “the smoking mirror”, is the god of the occult, of the sorcerers, owner of destiny, lord of the night, the secrets and the mystery. The black idol of Ozteotl used to be revered in a cave, when the Spanish friars came and saw traces of blood sacrifice, so they and condemned its worship. Legend says that 3 days after the friars condemned the worship of Ozteotl, they found the idol broken on the ground and the figure of a black Christ was on its place. 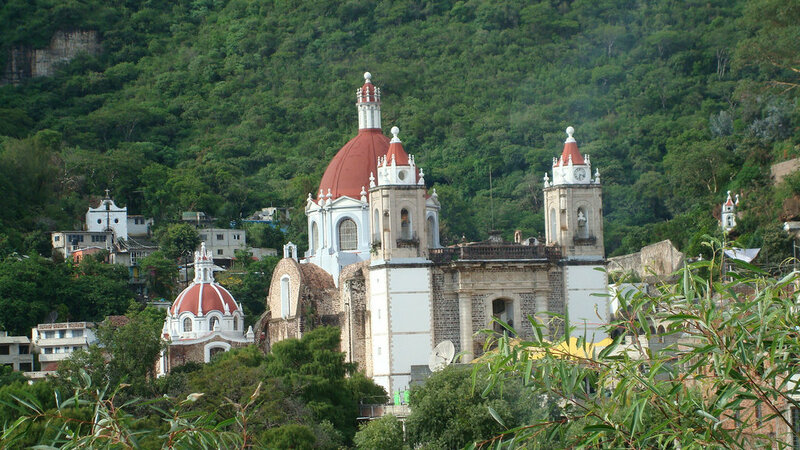 From that day forth, the “Lord of Chalma” became the second most important religious cult in Mexico, just after the cult of the Virgin of Guadalupe. The place where the old cave used to be, is now where the Sanctuary of the Lord of Chalma is, and thousands of people make pilgrimage to this place 13 times through the year because they say that prayers are listened and miracle healings become true. Chalma pilgrims are known for the “religious dancing” as a sort of prayer. 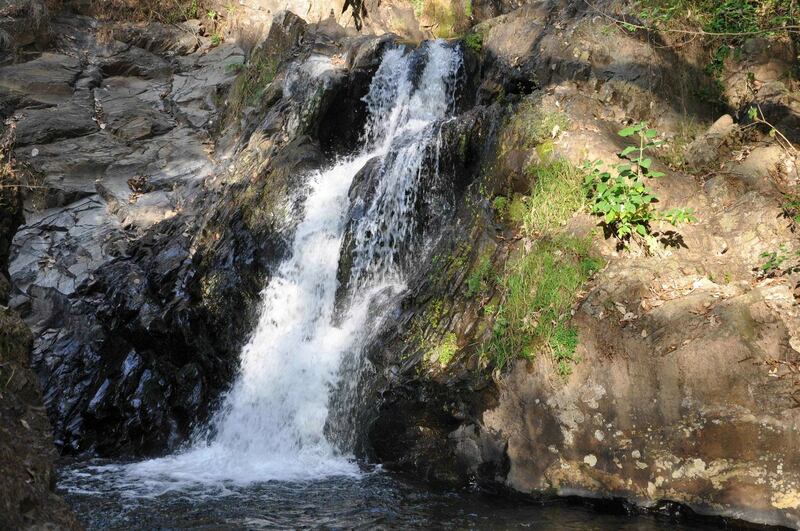 At the back of the church, behind the monastery flows a stream – where people still bathe in water from the same spring which fed Ozteotl’s cave. The Sanctuary is surrounded by beautiful mountains and have crosses on top of them, where the ancient Aztec rituals and catholic ceremonies where syncretized, and in certain time of the year, rituals are made in this crosses to keep the spirits at bay. Near Chalma there is an enormous 1100-year old cypress tree called the Ahuehuete, meaning ‘old man of the water’ in Nahuatl, the indigenous language of central Mexico. From beneath the roots of the tree flows a much-venerated sacred spring. Women gather water from the spring and pour it over their bodies in hopes of becoming fertile. In an expression of joyful spirit, many pilgrims wear crowns of flowers and dance as they offer prayers. Malinalco has become a favored site for cultural tourism and accommodates visitors in a small town atmosphere with colorful souvenirs, crafts and excellent restaurants. The Malinalco golf club draws tourist every weekend and holidays. This historical site used to be the mexica center for worship of Malinalxochitl, sister of Huitzilopochtli. She was a sorceress goddess of herbs and witchcraft, as well as snakes and insects. She is the patron god of Malinalco, which prints the feminine and magical essence of the town. 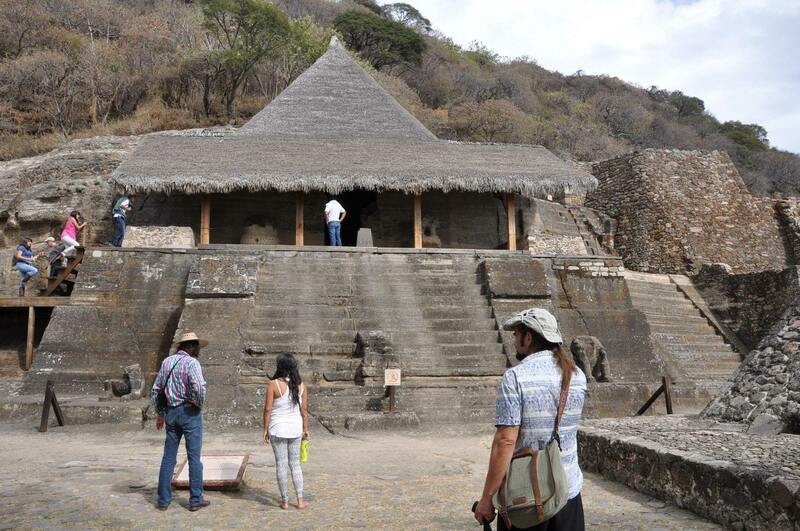 In Malinalco you can also find the temple in a pyramid, carved in a monolithic architecture, where the sacred rituals and trials where the eagle and jaguar warriors where trained and initiated. The serpent-like doors to the temple, were the representation of the doors to the underworld, where magical rites and sacred ceremonies were made by these warriors in order to be reborn with a new knowledge about themselves and their role in the world. Malinalco is located 25 minutes away from the Nierika Center, and we can accommodate transport for you if you wish to visit it.